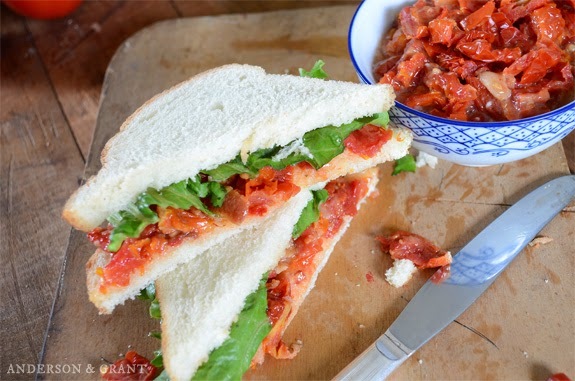 A unique twist on a traditional BLT, this Sun-Dried Tomato and Bacon Sandwich Spread is the perfect accompaniment to summertime salads for a picnic or lunch. 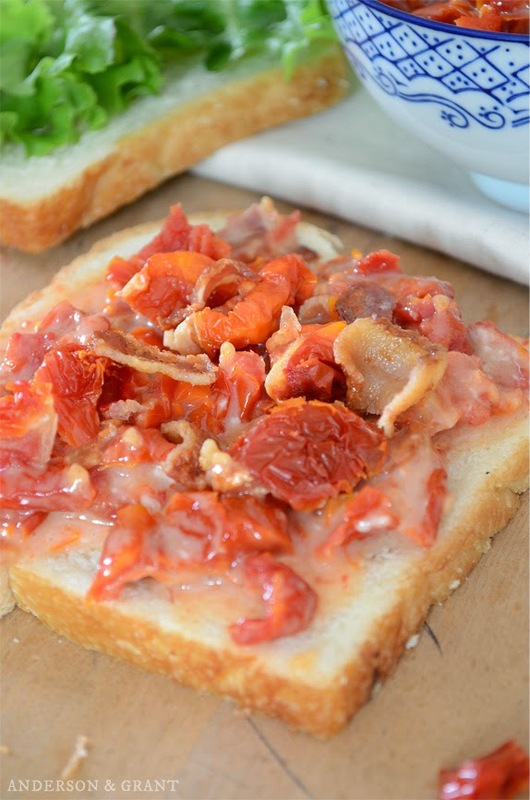 You will love the creamy mayonnaise base packed with tomatoes and freshly cooked bacon. 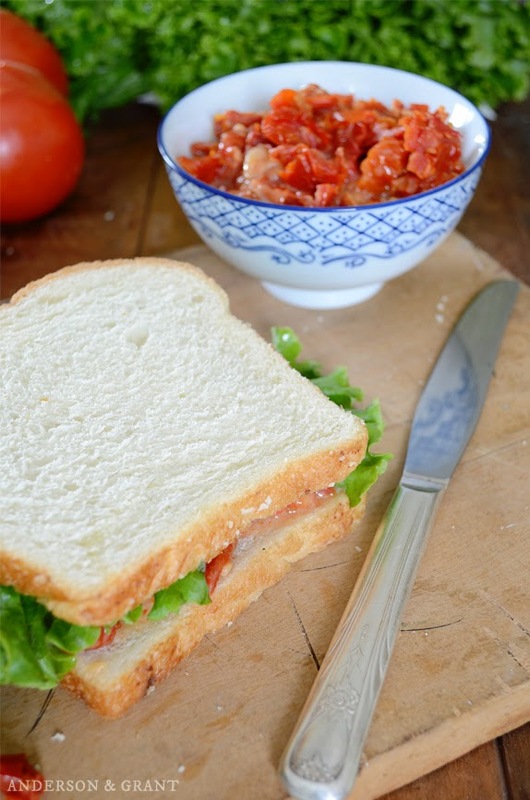 Bacon, lettuce, and tomato sandwiches are a basic, easy to prepare food that most people find delicious. A juicy tomato right from the garden, some freshly cooked bacon, and a green leaf of lettuce layered between two slices of bread with a spread of mayo. Is your mouth watering? Well, today I'm sharing an even more delicious twist on this traditional favorite! Summer get-togethers and picnics are the perfect time to serve up some sandwiches alongside bowls of pasta salads. 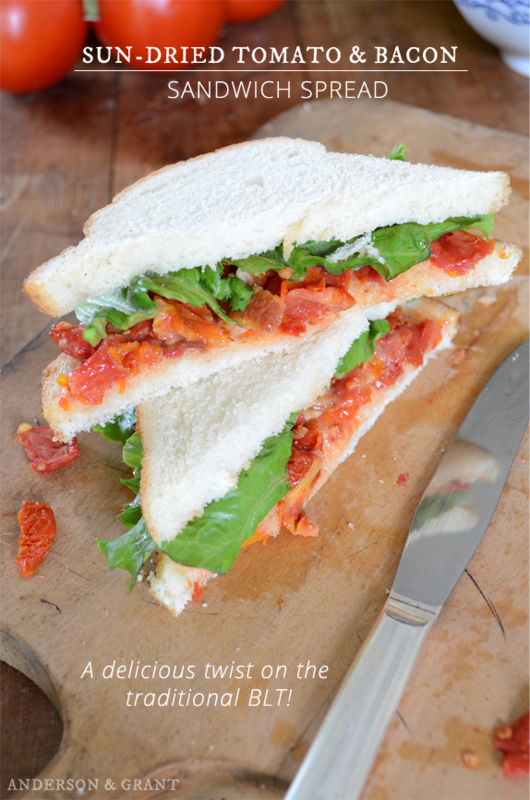 These Sun-Dried Tomato and Bacon Sandwiches are perfect for making along with everyone's favorite chicken, egg, and ham salad sandwiches. 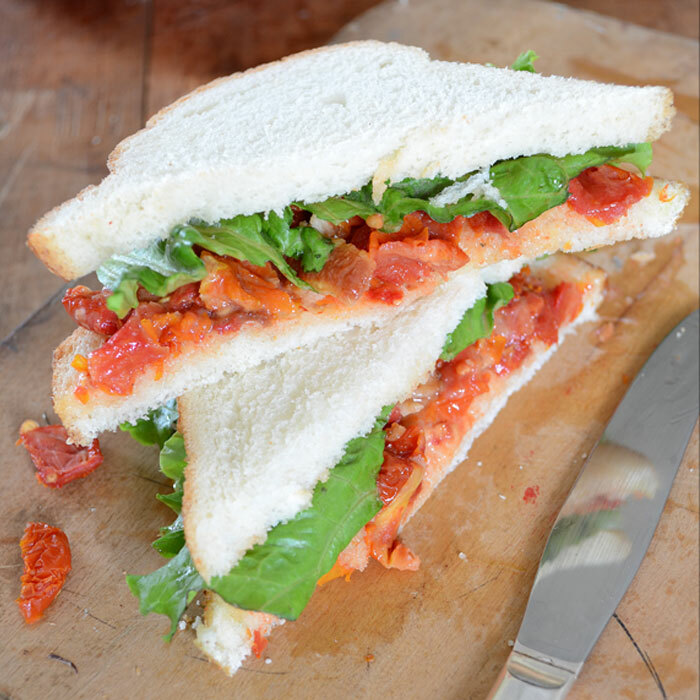 All of the ingredients for a traditional BLT (aside from the lettuce) are mixed together into a creamy spread making this an easy sandwich to make for yourself or a crowd. You could also an serve it spread on pieces of baguette or with crackers as a dip for appetizers. 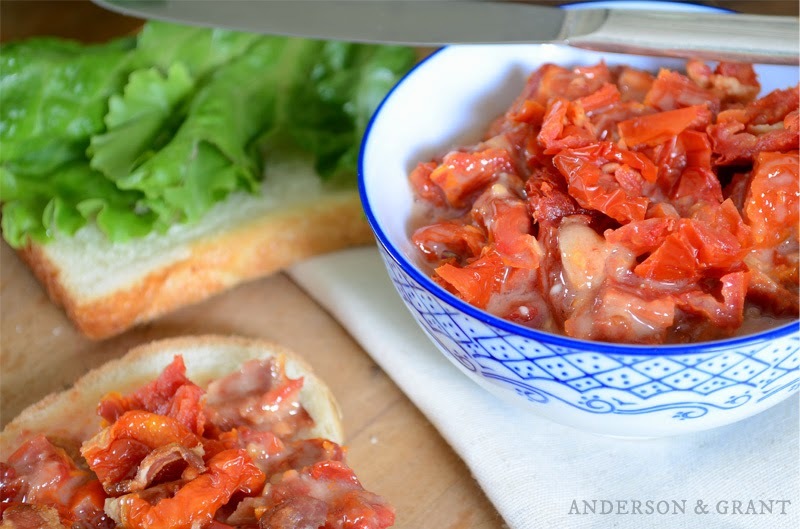 Sun-dried tomatoes can be purchased already dried online at the grocery store, or there are numerous tutorials on the internet about how to dry fresh tomatoes yourself. For a totally homemade spread, you can also use my recipe for homemade mayonnaise. Bring water to a boil on the stove. 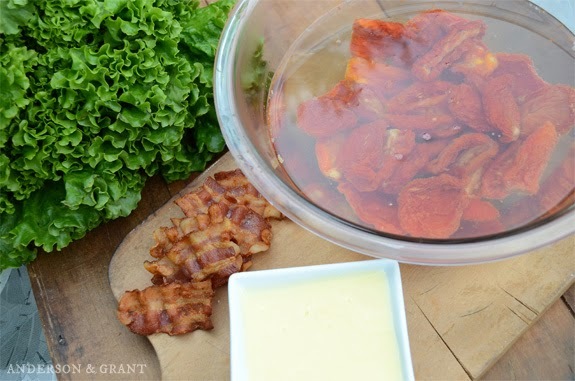 Remove from the heat and soak the dried tomatoes in the water for 20 minutes. Drain the water off and pat the tomatoes dry. Chop them into coarse sized pieces. While the tomatoes are soaking, cook the bacon in a fry pan. Drain it on paper towel. Chop the bacon into pieces as large as the tomatoes. Add the tomatoes and bacon to the mayonnaise and season with a little salt and pepper. Gently mix the ingredients together well. Spread the mixture on your bread making sure the entire surface is coated. 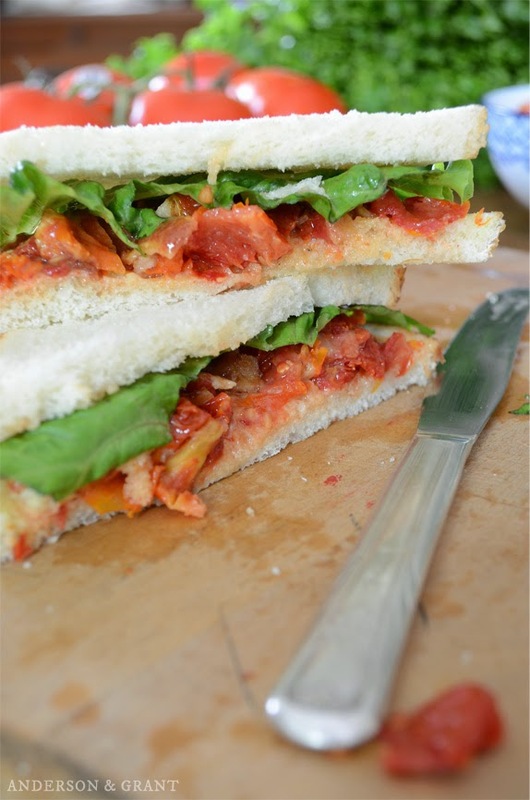 Top with a lettuce leaf and cut the sandwich on a diagonal or into fourths. Depending on how you make it, homemade mayonnaise can be a bit thinner than store bought. The mixture will be creamier than in these pictures using the purchased mayo.....either way is delicious! Simple and delicious for a summertime sandwich.....Enjoy!